Most lantern clocks are of the traditional style and shape we regularly recognise them by. A few however were made with arched dials, and a much smaller number with square dials. They were perhaps a step on the way towards becoming a longcase clock. Square dial lantern clocks are uncommon. In London a very few were made from about 1690 for a short-lived period of maybe ten or fifteen years. By this date the lantern clock was fading from popularity in London, which may be a further reason we see so few. In the provinces square dial versions were more popular from the same period than in London, though they were never very numerous anywhere. Arched dial examples begin about the same time but were more popular and were produced, usually as timepiece alarm clocks, till the 1790s and beyond. Of course, longcase clocks with lantern type posted movements were made for many years in southern and central England, but a square dial lantern clock was made to hang on the wall, just like a normal lantern clock would, by means of a hoop and spurs. Just occasionally one might be made to sit in a hooded wall case. The difference between a square dial lantern clock and a square dial longcase with lantern movement is not just that one has the hoop and spurs and the other doesn't. It is a question of dial size. Square dial lantern clocks of standard (i.e. full) size usually have a dial of about eight inches square (or less) and a total height similar to that of a regular lantern clock at a little over fifteen inches overall. A longcase would more likely have a ten-inch dial, or just possibly nine. However I did recently see a true, wall-hanging lantern clock with a nine-inch square dial, which is very unusual. A square dial lantern would have turned brass pillars and would probably have feet and finials and maybe side doors and maybe frets too. A square dial longcase with lantern movement might have turned brass pillars, but would have none of the other features. 1. This square dial lantern clock is unusual in being a striking clock with alarmwork and still a miniature, the dial only five inches square, total height nine inches. Another type of hanging wall clock appears about this time, a type we call a hook-and-spike clock or sometimes a hoop-and-spike clock. These usually have square dials, but some arch arched or even circular later. But hook-and-spike clocks were made as a cheaper form of lantern clock, often by rural clockmakers who would use iron wherever possible, but especially for the pillars and plates - iron cost only one tenth of the price of brass. They cannot be confused with true lantern clocks. In the provinces perhaps the hook-and-spike clock was seen as a cheaper alternative to a longcase. You could hang it on the wall and then save up to buy a standing case for it later, if you wished. A few clockmakers, such as Walter Archer of Stow on the Wold in Gloucestershire, made a speciality of such clocks, which were appreciated in an agricultural area where disposable income was not high. With hook-and-spike clocks a square dial was normal; with provincial lantern clocks is was exceptionally unusual, with London lantern clocks it could be said to be very rare. I doubt whether I have seen more than half a dozen in forty years. London examples with square dials are very uncommon. Provincial examples are not so scarce. 2. The tiny size can be recognised when the clock is seen alongside one of standard size, nine inches against fifteen and a half inches. Pictured here however is a London-made square dial lantern clock with a difference, as it is a miniature one, its dial measuring only five inches square and its total height only nine inches. A standard size lantern clock is pictured alongside it to illustrate the difference and that stands about fifteen inches high. 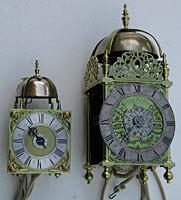 Most miniature lantern clocks are simply timepiece alarms, that is they have no striking train. This one on the other hand is a full striking clock with alarmwork as well. A striking alarm is uncommon, probably because a clock to be used near the bedroom was seldom required to strike. So it is surprising from that point of view but the more surprising in being a square dial miniature. If a full-sized square dial lantern clock of London make was unusual, a miniature is a much rarer item. In fact I cannot recall ever having seen one before. Why a miniature? Presumably a customer's request, perhaps made to be transportable. In fact the original verge pendulum of this clock is longer then the height of its body, which means that the pendulum rod would foul against any surface it was rested on. For this reason the maker has provided a pendulum carrying hook, set into the back right pillar, in the same way that a verge bracket clock would have a pendulum holdfast. This is a lantern clock of a size we would regard as portable, yet it cannot have hung, as they usually did, on a hoop and spurs, as there is no sign of any. In fact the topplate is so cramped with the escapement backcock and the alarmwork that there is simply no room for a hanging hoop. We must conclude that it sat originally on a wall shelf, or just possibly in a hood, though its high bell would have meant a tall hood. John Trubshaw is known for longcase clocks, bracket clocks and watches, but I know of no lantern clocks by him other than this one. The former were all made for a higher-class clientele than the humble lantern clock, so it is perhaps not surprising that when he did make a lantern clock, he made a de-luxe version with strikework as well as an alarm. 3. The movement is daintily made with a finely-filed hammer stop with bird-beak terminal. Brass wheel collets of a delicate 'flying-saucer' shape. John Trubshaw was born about 1665. We do not know where, but one of this name baptised in 1666 in Burton on Trent might be him. He was apprenticed in 1679 through the Clockmakers' Company to Robert Halstead, who was principally a goldsmith. As a clockmaker, Robert Halstead too was known for longcase and bracket clocks and watches, but not lantern clocks. John Trubshaw was free of his apprenticeship in January of 1687. After this his presence is recorded only through records of his taking new apprentices in the Company. In 1689 he took Stephen Mallett from Robert Halstead, from whom he later, before 1691, took over another apprentice, Joseph Bell. This connection may imply that he worked for the first year or two after 1687 for Halstead. His own later apprentices included John Parsons from 1695, Joseph Tilly from 1696 to 1704, and Thomas Grace from 1704. No lantern clocks are known by any of his apprentices, though other kinds of clocks are known by some of them, some of whom became goldsmiths. In 1710 he was made Assistant in the Company, and in 1714 was elected to the next higher office of Warden, but died before he actually held the office. A record of his death has not yet been traced. The clock illustrated here is signed 'Ino. Trubshaw London', the capital I being the preferred alternative for a capital J. There is nothing remarkable about the signature. What is exceptionally unusual is the position of the signature, which is set at the base of the dial. At this period we would expect the maker's name to be on the chapter ring, or just possibly in the dial centre, though the latter is not normal on a lantern clock dial with a matted centre, such as this one. The position of signing at the base of the dial plate was common in the late seventeenth century on longcase and bracket clocks, and here the maker is treating his dial like one of those. Could this be further indication that John Trubshaw was principally a maker of those types and not of lantern clocks?